While Prince Harry and Meghan are busy with their tour Down Under, the Duke and Duchess of Cambridge returned to royal duties last night after a few days off. 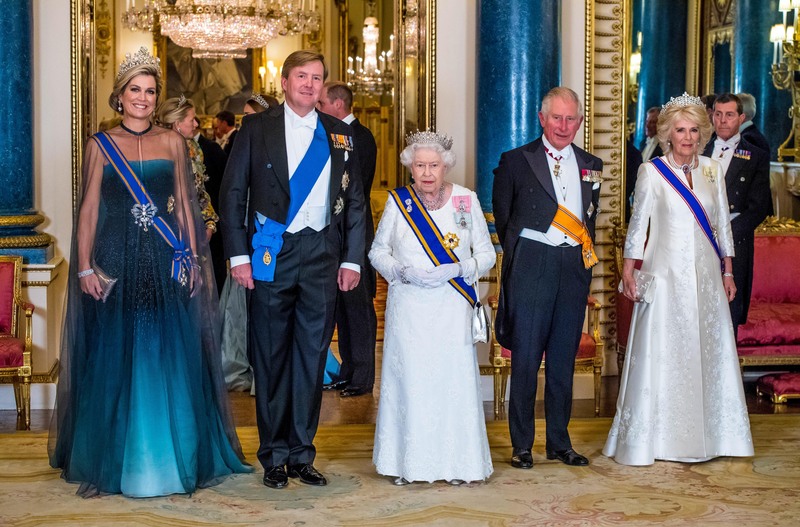 Duchess of Cambridge, Catherine, and William donned their finest evening wear for the Netherlands State Banquet on Tuesday, held in order to mark the country’s visiting King and Queen. It’s one of Catherine’s first official duties since returning to royal life after her six-month maternity leave. 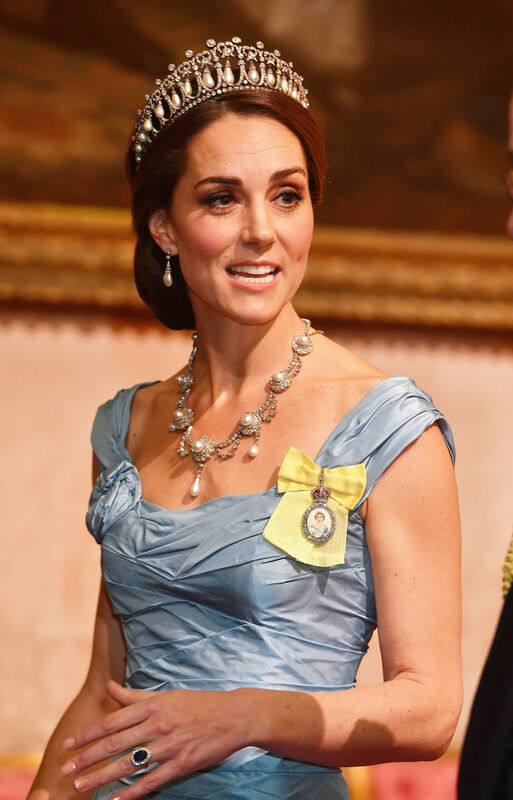 For the evening, the Duchess wore an impressive, light blue ball gown, accessorising with glittering tiara and necklace loaned to her for the evening from the Queen. But royal fans were quick to notice another intriguing accessory on the Duchess – a badge, seen worn on her left shoulder. And it turns out, there’s a sweet meaning behind the new item – only seen on Catherine once before. The badge is a Royal Family Order, a historical memento usually featuring a portrait of the current monarch on it. The Royal Family Order is actually something the Queen personally gives out to female members of the royal family, as a gift. In the past, Sophie, Countess of Wessex has been seen wearing one. But of course, it’s only recently that Catherine has been seen wearing hers, suggesting it is a new present. Kate’s is also believed to be a little different to the other royal family badges. According to Majesty magazine, hers is made from glass rather than ivory – believed to be a show of support for a cause close to her husband’s heart, stopping the ivory trade. But although the Duchess of Cambridge was wearing one touching honour from the Queen – she actually missed out on another during the glamorous evening. The Duchess was noticably not wearing a blue sash, despite that fact that all the other royal female attendees – including the Netherlands Queen Maxima, the Duchess of Cornwall and Queen Elizabeth II, were. People magazine reports that the sash represents the Royal Victorian Order of Queen Elizabeth II, which is an esteemed honour recognising personal service to the monarch, and something also given to members of the monarch’s family. It is also given to visiting monarchs. As Catherine wasn’t wearing the sash, it’s believed that she doesn’t yet hold the honour – again, unlike Sophie or Camilla, Duchess of Cornwall. It’s thought that Catherine does not yet have one given that she is still relatively new to the royal family – having only married Prince William in 2011. She also has not performed as many duties as the likes of Camilla, given that she’s only been a royal for seven years. And, in that time, it’s important to note that she has also been bringing up her children. In time it’s thought that Catherine – and perhaps eventually Meghan – will receive the special honour from the Queen, and will wear it to special state occasions.